…decorations? 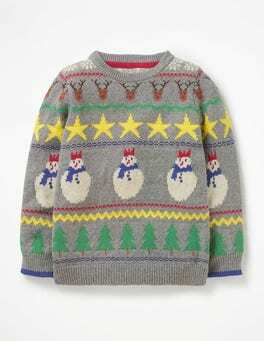 The yoke is patterned with friendly snowmen and traditional trees complete with 3D French knots. 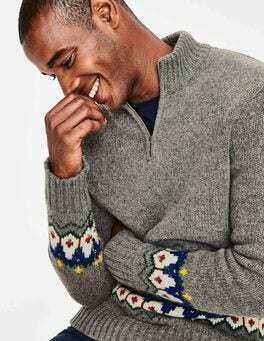 We've added cute buttons for easy dressing and contrast Fair Isle cuffs for extra festive spirit. 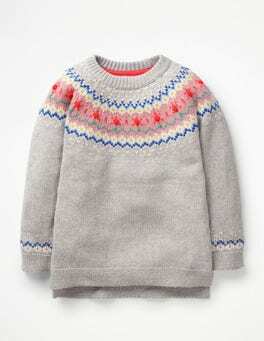 With long raglan sleeves and cosy knitted fabric, it's more than a match for Jack Frost too. 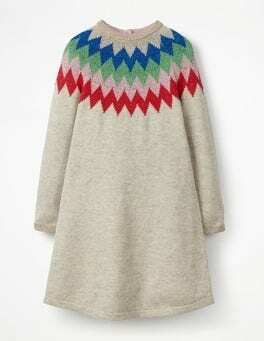 This cold-weather knitwear staple was just made for braving those blustery seaside walks. A super-cosy cotton and merino-mix fabric locks in warmth, while the jumper's classic pattern adds fun to jeans and wellies. All that's missing is a woolly scarf. …bobbing for apples, late night shopping or enjoying a roaring bonfire – this luxurious, lambswool-blend scarf will keep you toasty. 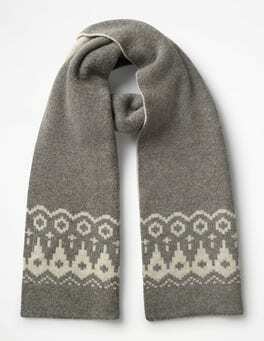 Made from a substantial, heavyweight knit bearing a simple Fair Isle pattern, the effortless combination of grey marl shades ensure it can accompany you everywhere. Cold snap ahead? 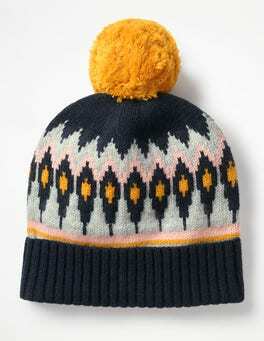 Our Fair Isle knitted beret has come to the rescue. We've added extra-special golden glittery yarn, and it goes without saying that no winterwear is complete without a pompom, so we put one of those on too. Take that, chilly weather. 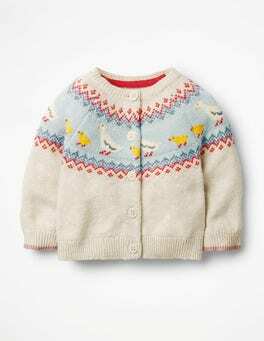 Don't let chilly weather stop you running wild, just wrap up warm in this Fair Isle knitted cardigan, with its colourful trim around the neck. Wear it with jeans and some wellies and you're ready for long country walks (and optional puddle jumping). Stop the press – we’ve found the perfect cosy jumper for lazy weekends, countryside rambles and frosty mornings. 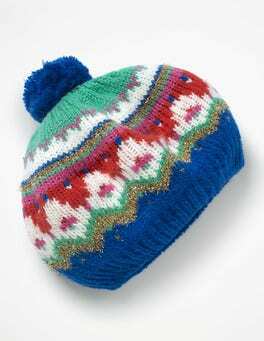 It features a contrast Fair Isle pattern and a feminine, semi-fitted shape. Pair with jeans, wellies, a wax jacket and acres of rolling hills. …agree: this one's a real winter winner. A dash of so-soft alpaca wool makes this jumper extra warm. It has a relaxed-but-defined shape, and the tipped hem and cuffs make a striking contrast. 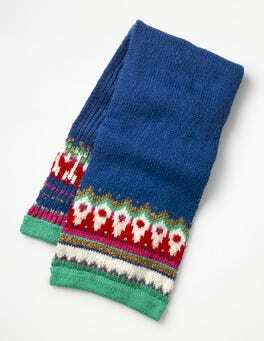 But first prize goes to the standout Fair Isle jacquard. Bet you can't wait for the next frosty morning. 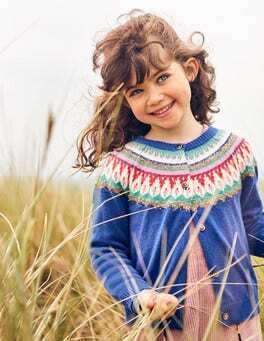 This lambswool-mix jumper keeps grown-ups happy with a sweet Fair Isle design, and little ones warm in a chunky knit. Team with collared shirts and trousers for smart occasions or jeans and tees for snowball fights. We know which we'd prefer. 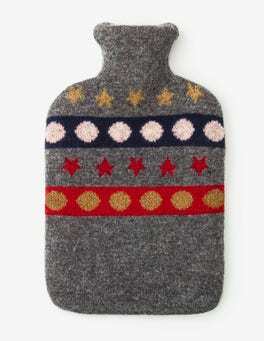 Long, cold nights call for a truly excellent hot water bottle. 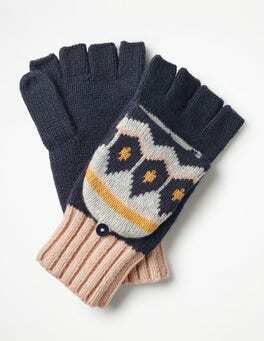 This one is covered with a soft lambswool-mix fabric that's perfect for cuddling up to on the sofa or warming chilly toes in bed. We think sausage dogs make life more fun, so we've put a whole pack of them on this Fair Isle knit. It's full steam ahead with the new rainbow train option. Both twin with ultra-soft and cosy knitted cotton leggings in bold stripes. …cheer (AKA soft cotton and cashmere). 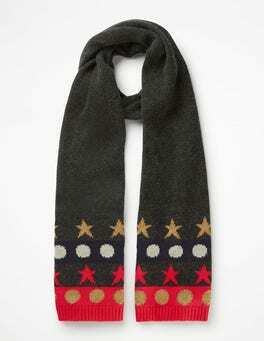 Raised French knot detailing adds fun texture, with two Christmassy designs to choose from. Father Christmas riding his sleigh is embellished with glittering thread, while the other has a traditional Fair Isle pattern. It's a tough choice, so we recommend both. 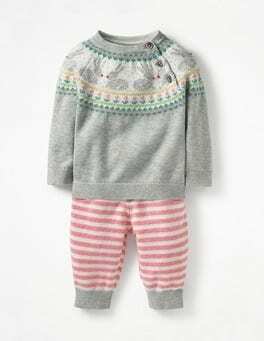 Have fun and frolics with the playful reindeers on this snuggly romper. 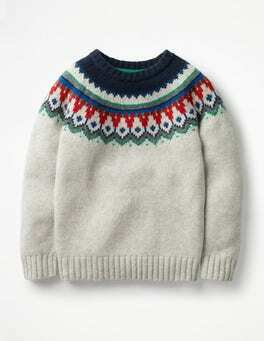 The Fair Isle design is made from a cotton blend that's cosy and kind to baby's skin. Buttons on the leg and shoulder make it simple to slip on and off in a hurry, so changing time is that little bit easier. 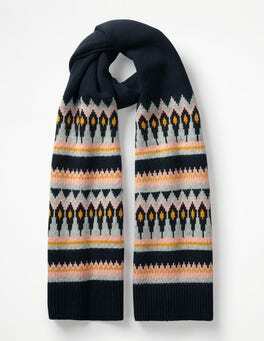 …chanced upon this scarf. 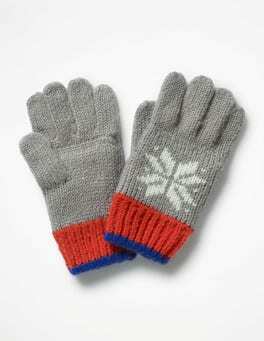 It's made from wool for supersoftness and ultra-cosiness (both of which are words, of course). 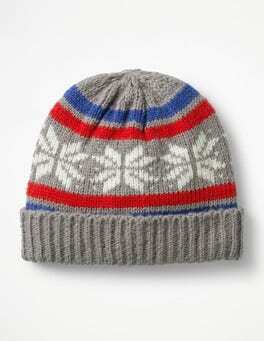 Choose grey marl with a star-studded, Fair Isle design for a wintry classic. 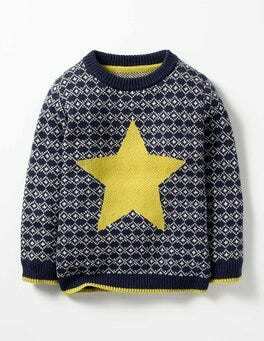 Or go for navy with a shooting star, which magically catches the light thanks to its metallic thread.